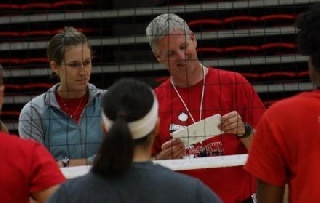 The Youngstown State volleyball team was picked to finish seventh in the Horizon League in a preseason poll of the league's coaches, the conference office announced on Thursday. The Penguins return 97 percent of their kills, 96 percent of their blocks and 91 percent of their digs from last season's squad that finished sixth. Additionally, YSU has seven experienced seniors on its roster, including Horizon League Player-of-the-Year candidate Missy Hundelt and all-conference candidate Jenna Cavanaugh. Youngstown State was 15-14 overall and 5-9 in the Horizon League last season, its best in 13 years. The poll had defined clusters with three teams receiving between 44 to 41 points, four receiving between 25 and 20 points and one with seven. Valparaiso received four first-place votes and was selected as the preseason favorite with 44 points, two ahead of defending champion Cleveland State. Milwaukee, which finished seventh in an off year last season, was picked to finish third with 41 points. League newcomer Oakland was picked to finish fourth with 25 points, followed by UIC with 23 points, Green Bay with 22 points and YSU with 20 points. Wright State was tabbed to finish last with seven points. The preseason all-league team will be announced on Friday, one week before Youngstown State opens the season at Coastal Carolina.